This week has turned into a self-inflating kiddie pool of editing assignments. I realize this is a bizarre image but it's an accurate description of the way my brain is being contorted like a googly face pushed up against glass so we'll live with it. The bottom line: it's a mixed blessing because while I love editing and the learning therein, and love even more being able to finance all my yarny indiscretions, I get less time to knit. 5" Brittany Birch double pointed needles! Omigosh, they are so cute to work with! How come I never knew how fun tiny needles can be? I guess I've only ever used 10" metal ones in the teeny sizes. This, by contrast, is tactile heaven, more fun even than the way longer Brittany Birch needles I bought for making hats. It's like playing with dollhouse toys. I will definitely need more sizes next time I'm in Stitch because I know I will want to be knitting socks while I'm knitting mittens, and I hate waiting for needles that are not so very prohibitive to buy in the first place. Speaking of which, doesn't it just figure that yesterday was the very same day a new batch of yarn showed up at Twisted Fiber Art? So that in spite of my many, many recent knit-related purchases I just had to buy more for spinning and for socks? You can actually see the crunchiness, can't you? 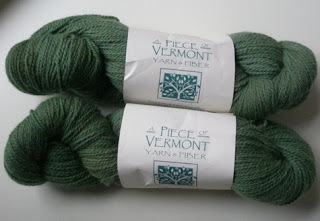 It's the coolest yarn to work with - a bit of alpaca, a lot of wool, really nicely spun, with serious backbone. I'm so glad I got lots.